Susan, who has been with the Center since 1996, serves as the Data Coordinator and is responsible for collecting and reporting all Form II data. She maintains close ties with the SCI follow-up clinic, reviews all records of patient annual and interim evaluations to ensure appropriate data are collected, monitored and reported. Susan also identifies patients who require follow-up evaluations for data collection. In addition, she is responsible for the compilation and dissemination of the SCI Model Systems' bibliography annually. 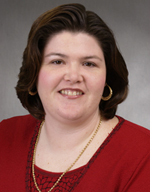 Susan is a graduate of West Chester University with a degree in Education.